Remember liberal weenies insisting that you can’t cut taxes and expect more tax revenue? April was the biggest tax haul month for the federal government EVER! 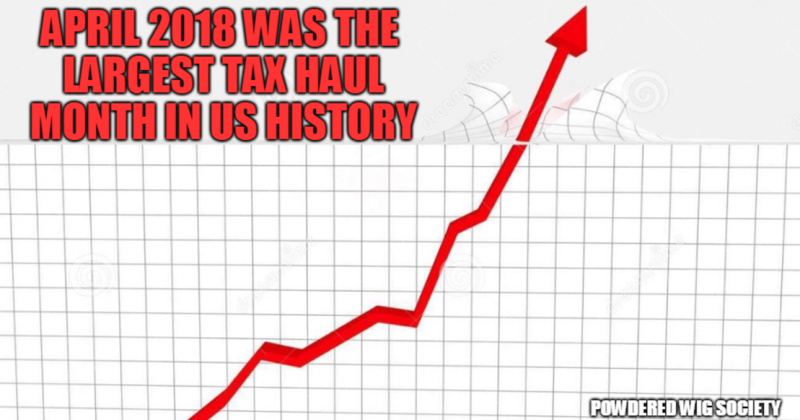 April was the biggest federal government tax haul in US history with an incredible $218 billion surplus, shocking all economic forecasters and pundits. It does if you can see the big picture. What liberals don’t understand is that taxes, like the economy in general, is not a zero-sum game. You can make it grow. Restoring investor confidence by cutting regulation and reducing taxes convinces the fat cats to get off their stash and spend it to make more money, which is subject to taxes. Pay raises and bonuses also get taxed and there has been no shortage of those passed out by employers since President Trump’s tax cuts went into effect. It isn’t rocket science. It is common sense. It is also history. It is also right! JFK and Reagan employed the same “tax cuts = more taxes” policy and both times it led to economic booms. Official numbers are due out from the Treasury Department in a few days, but the CBO is usually accurate to within a couple billion dollars. April is always a strong month for government finances, with taxpayers filing their returns for the previous year and settling up what they owe, even as expenditures often dip for the month. But this year was particularly strong, with receipts jumping 13 percent compared to a year ago. The news couldn’t come at a better time for President Trump and congressional Republicans, who were facing major questions about the damage last year’s tax-cut package might do to future deficits. Just a month ago the CBO projected that the deficit would quickly soar back to $1 trillion a year. So far, seven months into fiscal year 2018, the government is running a $382 billion deficit. That’s $37 billion worse than last year’s figure through seven months, chiefly because spending has surged 5 percent so far this year. Most of that is essential military spending to rebuild that which Barack Hussein decimated. Higher inflation is driving up the government’s debt payments, while Homeland Security disaster relief, Social Security benefit payments and the Defense Department also saw significant increases.